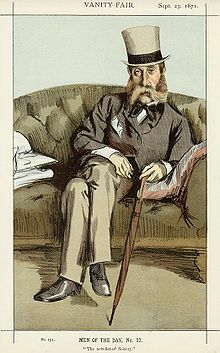 George John Whyte-Melville (19 June 1821 – 5 December 1878) was a Scottish novelist much concerned with field sports, and also a poet. Whyte-Melville (far left) playing in a foursomes golf match, c. 1852. J. O. Fairlie stands second from the right. Major George John Whyte-Melville was born in 1821, at Mount Melville near St Andrews, Scotland, as a son of Major John Whyte-Melville and Lady Catherine Anne Sarah Osborne and a grandson on his mother's side of the 5th Duke of Leeds. His father was a well-known sportsman and Captain of St Andrews Golf Club. The son was Grand Master of the Freemasons of Scotland from 1834 to 1866. George was tutored privately at home by the young Robert Lee, then educated at Eton. He entered the army in 1839, became a captain in the Coldstream Guards in 1846 and retired in 1849. He married The Hon Charlotte Hanbury-Bateman in 1847, and they had one daughter, Florence Elizabeth, who went on to marry Clotworthy John Skeffington, 11th Viscount Massereene and 4th Viscount Ferrard. In 1849 Whyte-Melville was the subject of a summons for maintenance by Elizabeth Gibbs, described as "a smartly-dressed and interesting looking young woman", who alleged that he was the father of her child. She stated that she had known Whyte-Melville since December 1846 and that she had given birth to his child in September 1847. The Judge found for the defendant as the written evidence could not be proved to be in Whyte-Melville's hand, but allowed the complainant to apply for a further summons in order to obtain proof. After translating some Horace in 1850, Whyte-Melville published his first novel, Digby Grand, in 1852, which was a success. He went on to publish 21 other novels and became a popular writer about hunting. Most of his heroes and heroines – Digby Grand, Tilbury Nogo, the Honourable Crasher, Mr Sawyer, Kate Coventry, Mrs Lascelles – ride to hounds, or are would-be members of the hunt. Some characters reappear in different novels, such as the supercilious stud groom, the dark and wary steeple-chaser, or the fascinating sporting widow. Bones and I, or The Skeleton at Home, is an anomaly in his work, as it is far from the realms of the hunting field or the historical romance. It centres instead on an urban recluse living in a small, modern villa in a London cul de sac, looking out on "the dead wall at the back of an hospital". His most famous lyric is also unusual in its unexpected melancholy – the words to Paolo Tosti's song "Good-bye!" Several of his novels are historical, The Gladiators being the best known. He also published volumes of poetry, including Songs and Verses (1869) and Legend of the True Cross (1873). However, it is for his portrayal of contemporary sporting society that he is most regarded. Henry Hawley Smart is said to have taken Whyte-Melville as one of his models when he too set out to be a sporting novelist. The catch phrase for which he is best remembered comes from a song about hunting: "Drink, Puppy, Drink". This recurs also in The Flashman Papers by George MacDonald Fraser, as a frequently mentioned favourite song of the anti-hero. In 1876, Whyte-Melville penned the rarely attributed, but widely recognized opening line to the short poem The Object of a Life: "To eat, drink, and be merry, because to-morrow we die." When the Crimean War broke out, Whyte-Melville went out as a volunteer major into the Turkish irregular cavalry, but this was the only break in his literary career. Whyte-Melville lost his life in 1878 whilst hunting, falling as he galloped over a ploughed field in the Vale of White Horse. He had moved to Tetbury, Gloucestershire, in about 1875, the better to follow the Beaufort and Vale of White Horse hunts. George Whyte-Melville was buried in the churchyard of St Mary's, Tetbury, within a few feet of his property, Barton Abbotts. It has been claimed that Whyte-Melville's death inspired the well-known hunting song "John Peel" – although John Peel was a real-life huntsman in the Lake District, the author of the lyrics, John Woodcock Graves, was a close friend of Whyte-Melville. After imbibing a quantity of alcohol at Whyte-Melville's funeral, Graves penned some verses in tribute to Whyte-Melville, set to the melody of a traditional folk song entitled, "Bonnie Annie". Through that clean world where your Sir Galahads ride! 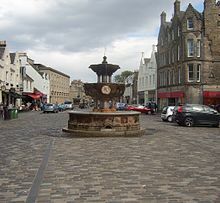 At the instigation of his mother, Lady Catherine Melville, a memorial fountain to him was erected by public subscription in Market Street, St Andrews, Fife, in 1880. The three-tier cascading fountain is about 14 foot (427 cm) high, composed of sandstone and Dalbeattie granite. It features four marble plaques dedicated to Whyte-Melville, which show his bust, the family coat of arms, the arms of the Coldstream Guards, and a memorial inscription. Due to corrosion of its internal pipes, it fell into disuse – possibly in the 1930s – and was treated as a flower bed for many decades. A local councillor and the St Andrews Merchants' Association led a campaign that ended in its resuming function as a fountain on Wednesday 8 July 2015. ^ "Whyte-Melville, George John" . Dictionary of National Biography. London: Smith, Elder & Co. 1885–1900. ^ a b c d e f "MR. J. G. WHYTE MELVILLE". The Empire. Sydney: National Library of Australia. 2 September 1867. p. 2. Retrieved 18 October 2013. ^ Freemasons Hall, Edinburgh, busts of former Grand Masters. ^ "The Lee family, boatbuilders of Tweedmouth". Friends of Berwick and District Museum and Archives (berwickfriends.org.uk). ^ The Times, Saturday, 14 July 1849, p. 9. ^ "Whyte-Melville Memorial Fountain". Visit St Andrews. ^ "Whyte-Melville Fountain". UK Attraction. ^ "Plans in full flow to return water to fountain". The Saint. ^ "Water flows again through fountain in heart of St Andrews". Fife Today. ^ Index to Victorian Periodicals 1804–1900. pp. 414–18. The Autobiography of Captain Digby Grand was published in Fraser's Magazine from November 1851 to December 1852. ^ Index to Victorian Periodicals 1804–1900. p. 422–26. General Bounce was published in Fraser's Magazine, January–December 1854.